The Hanbury open-sided garden building needs to be seen to be appreciated. This building is superbly built, utilising sturdy, pressure treated timber throughout for long life and good looks. 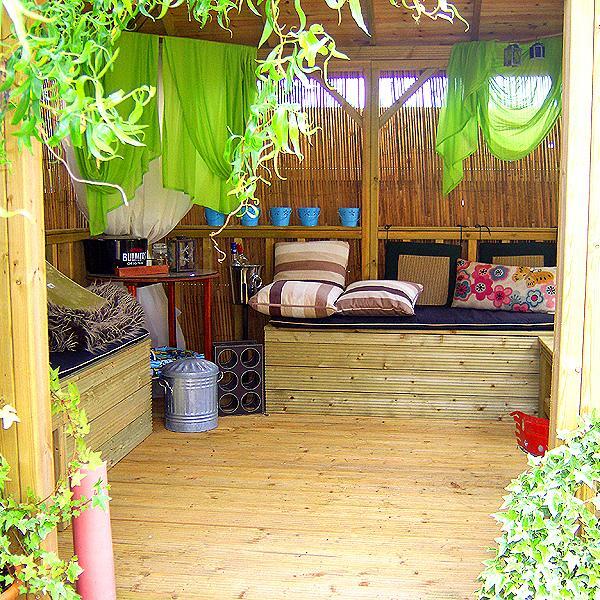 Whether used as a hot tub shelter, an outdoor dining area, or just somewhere to relax, this garden building is sure to give many years of pleasure. The apex style pressure treated slatted timber roof is supplied as standard, as is the attractive balustrade and spindles around the perimeter of the building. A 22mm fitted decking floor is an optional upgrade. 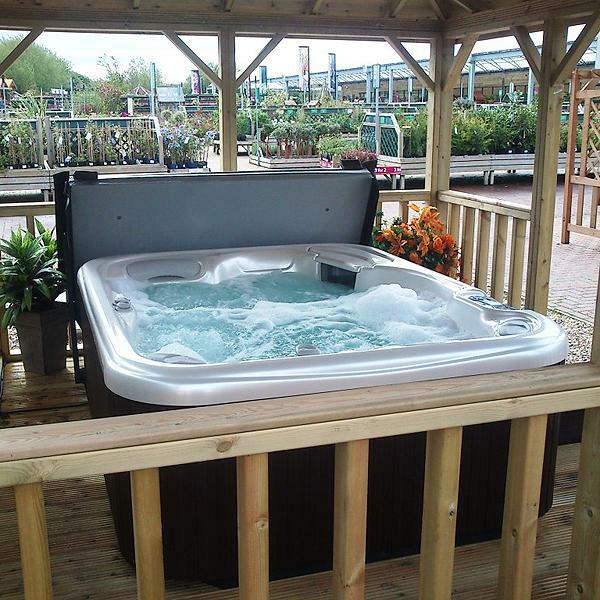 The Hanbury is available with the choice of a front or side entrance or additional entrances. Also available are optional half boarded and fully boarded panels - a great option to choose if you wish to give your building a more enclosed feel. Please look at our image gallery which will show you examples of this buildings along with pictures of their construction and optional items. Why Choose a Malvern Hanbury Apex? The attractive pressure treated timber has a long-lasting treatment forced deep inside the timber giving the timber a long life span and an attractive green hue. The Hanbury comes with open ballustrades for open and inviting outdoor space. 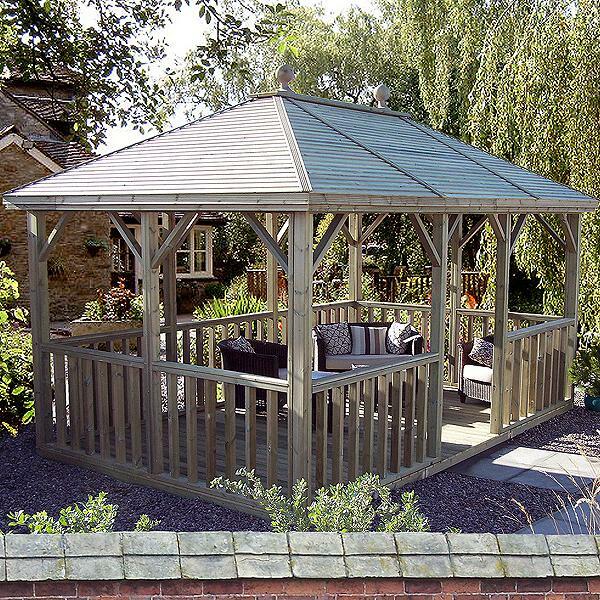 The Hanbury open-sided gazebo comes with an attractive pressure treated slatted roof, laid over the standard felt. The Malvern Hanbury Apex is designed with a ridge height of under 2.5m so that planning permission is only needed in special circumstances. 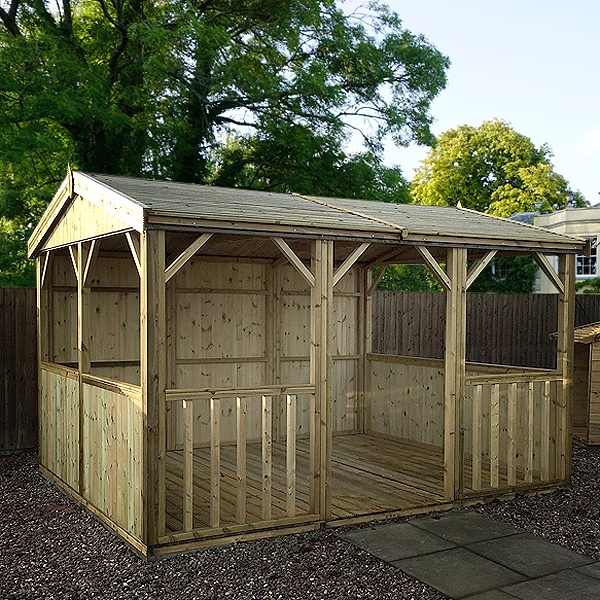 All our pressure treated garden buildings include a 3-year guarantee against rot and decay. Add half or fully boarded panels for extra privacy or protection from the elements. Choose a 22mm fitted decked timber floor for your Hanbury. The roof is under 2.5m in height so is not generally subject to planning permission. This particular building has optional half height panels on three sides and the standard balustrading along the front. This Hanbury is shown with the optional 22mm decked floor. This picture illustrates the different side wall options available with the Hanbury's. The standard feature is open balustrading around the perimeter with one entrance section. The sides of this building have optional half height boarded panels and the rear has optional full height boarded sections. Whether you choose the hipped roof, or apex roof Hanbury, these options are available to you. This is the inside of the 10ft x 10ft Hanbury: airy, sheltered, shaded and private this is a great place to unwind after a stressful day! This Hanbury is shown with the opional 22mm decked floor. Contemplating a dip in the hot tub? The Hanbury provides a great outdoor setting. Wining and outdoor dining, soaking in a steaming hot tub or keeping out of the hot sun; just a few uses for the sturdily constructed Hanbury. The balustrading is fitted around the perimeter with a choice of front or side entrance. The attractive green/yellow hue is a consequence of the pressure treatment which the building undergoes. This prolongs the life of the timber by forcing the preservative deep into each component. This is the Hanbury Hipped and is shown with the opional 22mm decked floor. All of our Malvern Traditional Summerhouses will be delivered by our expert team of fitters. We take pride in making sure that your building will arrive in perfect condition. As with all of our garden buildings we like to provide our customers with a suitable delivery time. We always give good notice of our arrival date, allowing you to be sure it is the right time for you. We always appreciate any helpful information regarding access to your pre-prepared base area and any details you may need to share with us about reaching you - so that the delivery process can run as smoothly as possible. When buying a Malvern Traditional Summerhouses, you can choose to purchase the optional installation. If you are thinking about having your summerhouse installed by our skilled team of fitters, please be aware that you will need to have a good, strong, level base - pre-prepared prior to your delivery date. We would normally recommend a base constructed from either slabs, concrete or heavy duty decking. We will always confirm these details with you when you order and if required, we will provide you with base plans for you building - so that no detail is left out! 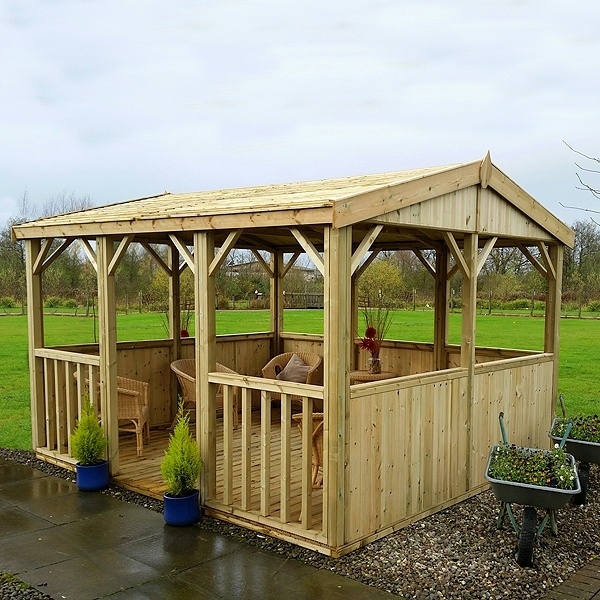 These measures ensure that your summerhouse will be both delivered and installed without any inconvenience. Our delivery times can vary from season to season, but typically you should expect to receive your building around 3-4 weeks from when you order. All of our buildings are made to order so, during the busy spring to summer seasons, this may increase to 6-10 weeks dependant on the building that you have purchased. Please feel free to contact us on 0800 999 0123 to check our current delivery times. Where Can I See Malvern Open Gazebos and Shelters?